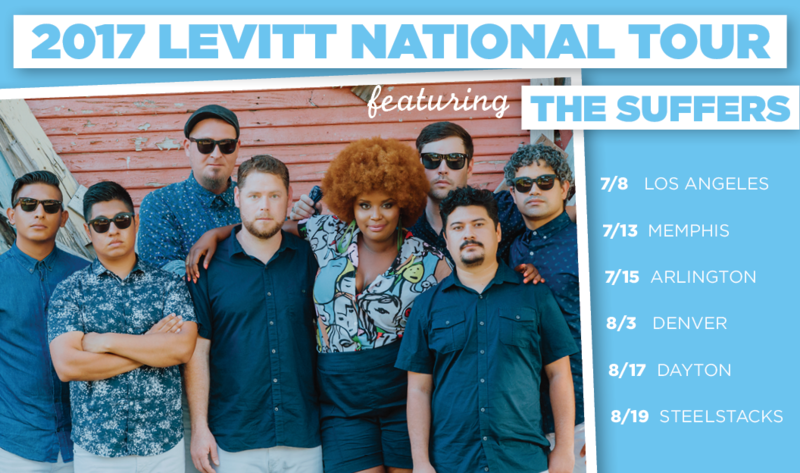 We’re thrilled to announce that The Suffers, an 8-member band hailing from Houston who blend musical influences as diverse as rock, R&B, country and reggae into a dynamic sound they’ve coined “Gulf Coast Soul,” will headline the 2017 Levitt National Tour. Now in its third year and created to celebrate the collective impact of the Levitt network of music venues in communities across the country, the 2017 Levitt National Tour will stop in six Levitt cities this July and August—Los Angeles; Memphis; Arlington, Texas; Denver; Bethlehem, Pa.; and Dayton, Ohio (home to a future Levitt Pavilion). This summer’s tour will invite Levitt audiences to experience these rising stars and critical darlings, hailed for their infectious rhythm and horns section mixing seamlessly with the sultry vocals of singer Kam Franklin. The Suffers originally came together as a 10-member act in 2011. Castaneda and the other band members all knew of each other from playing in various bands in the Houston area. Castaneda himself was in a country, Latin ska, and hip-hop band when he and keyboardist Pat Kelly formed The Suffers, originally envisioning it as a reggae cover band. In fact, their unusual name is inspired by a 1970s Jamaican film called The Rockers, in which musicians “suffer” to bring their art to the public. Named by Esquire as one of 40 must-hear bands at Austin’s SXSW in 2015, The Suffers have wowed all kinds of audiences with their “Gulf Coast Soul,” from the very intimate as one of NPR’s Tiny Desk Concert Series artists to large-scale crowds at the Newport Folk Festival and Austin City Limits Music Festival. They’ve reached even bigger audiences through appearances on late-night television shows like Jimmy Kimmel Live!, The Daily Show with Trevor Noah, and the Late Show with David Letterman. In fact, it was their appearance on Letterman’s popular show that marked a turning point in their career. “We realized we can’t go on the Letterman show and then go back to our jobs. So we had a discussion and all decided to make that leap,” explains Castaneda. “There are a lot of people who put their dreams on the back burner. But sometimes people need to pursue their dreams. Some people might say, ‘are you crazy?’ But we had to throw all our fears to the wind.” In early 2015, they dedicated themselves full-time to The Suffers and their self-titled album was released in 2016. The Suffers hope their personal story of pursuing their passion inspires those who come to their shows to explore their own talents and make bold choices. In early 2017, they toured in Europe and played a festival in Australia for the first time. And this summer, they will play their hearts out for Levitt audiences across the country. Expect the band to kick off their high-energy show with an unusual opening ritual, inspired by an article a band member read about yoga poses to build confidence and get adrenaline going. When they first appear onstage, The Suffers all raise their arms in the air and scream as loudly as they can to psych themselves up for their performance. The audience often joins in, says Castaneda. And after their shows, The Suffers love to meet and take photos with their audiences and inspire young musicians. See you on the Levitt lawn!